When I first started to integrate technology in my classroom I needed a place for students to get the assignments and to post about them. A few teachers at my school were using Edmodo for this and I jumped on board. I liked that I could create individual classes to make grading easier. 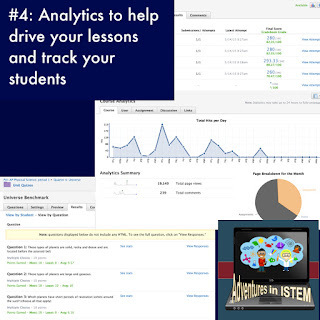 I also liked that I could assign them homework, online investigations and quizzes. The students enjoyed having everything in one place and the capability to post questions to other classmates. The downside was the lack of organization. Everything went into the feed so it was difficult to find older assignments or posts. Next came My Big Campus. The major pro of this one was the ability for my students to watch youtube videos. My district has blocked youtube for student use. With My Big Campus I could give students youtube videos for them to watch. I also liked that it was easier for my students to find their assignments. The major downside was that it was not free. My district paid for everyone to use it since it was a more secure site. Although I liked the features of My Big Campus I felt it was still lacking the ability for personalization. 1. The ability to make classes and groups. If you have GATE identified students in different classes like I do, they can belong to their individual class and then you can also group them all together in one group. This allows you to post questions to them as a whole group and they can discuss information even though they are in different classes. 2. The ability to make folders and organize the information the way you want it. I love the fact that I can make a folder for each Quarter. And then folders within those folders for quizzes, reviews, topics, whatever you want. If you make a mistake you can always change the folder or make a new one and move the assignment to it. 3. The ability to make one assignment, discussion, quiz, or video for a class and then copy it to the other classes. I only have to do it once and add all my links or files to the one assignment or discussion and then just copy it to the other classes. This saves so much time. I was also able to post videos, worksheets, links to websites on one class and then copy those to other classes as well. Plus it is integrated with google drive so I could take a document from my drive and then add it to an assignment. 4. Analytics. I am a huge fan of stats. I love that schoology gives numerical data and graphs to show how many posts a student has done overall and per assignment. For quizzes I can see how students did individually, how they did per question, how the class did as a whole, and which questions they did well on and which ones they struggled on. 5. Variety of quizzes. In schoology you can create almost any type of quiz. It will grade the multiple choice and short answer quizzes for you. You can make the multiple choice quizzes more like common core by having more than one answer for the question. You can then give the students partial credit if they get part of the question correct or make it all or nothing. You can also add images and video to the quizzes. For one question my students had to watch a video of a person on a skateboard and explain if the person was accelerating and why? The more practice students can have at answer multiple answer questions and questions with video the more prepared they will be for the common core state testing. 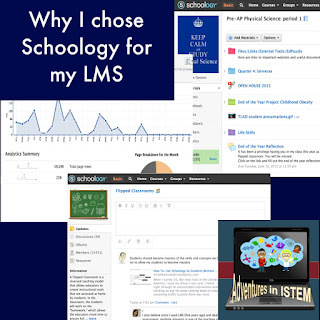 If you are thinking about integrating technology into your classroom than schoology is a great option to help you with this. It is an easy to use, free LMS (learning management system) site and the different collaborative groups you can join are a great place to learn about all the things you can do with schoology and with technology in general.